12 Days of Amazing Gift Ideas | Day 6: Fender Play: The Gift That Keeps On Giving + A Giveaway! This is a sponsored post written by me on behalf of Fender Play for IZEA. All opinions are 100% mine. Are your kids hard to buy Holiday gifts for? Mine didn’t use to be, but the older they get, the harder it is. Back when they were little, the newest and hottest toy in the store and on the shelves is what they wanted. It went like this: they saw a commercial and the commercial made them want the toy. A tad bit annoying at the time, but way easier, am I right? With my kids, part of it is because the older they get, the less material things they realize they need or want. They’re more into experiences and gifts that really mean something. The other part of it is my preference as the gift giver. I want to focus on quality instead of quantity and give them something I know they’ll love and use. Back in August and September, I shared with you a platform my oldest son was using to learn to play the guitar. It’s called Fender Play and has been an invaluable resource for him. Well, come to find out, my youngest son (who’s 13) also wants to learn to play the guitar. So that makes Fender Play the perfect Holiday gift for him! It really is the gift that keeps on giving. 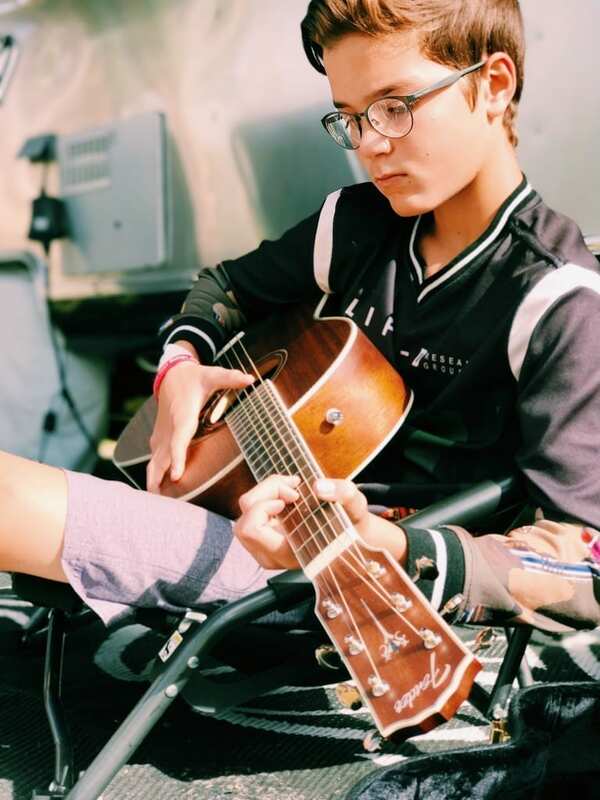 Not only will he learn to play guitar and pick up a skill that is just downright fun, but it will also give him confidence and help him develop math and coordination skills. Learning to play the guitar goes a lot further than just the fact that you learned an instrument. Fender Play is the perfect platform for both beginners and returning guitar players. It’s very easy to use! Plus, the lessons keep kids coming back for more since they are song- and riff-based using popular and instantly recognizable songs. No child wants to play the same chords over and over again from songs they’ve never heard. They’ll lose interest in a heartbeat. Using the Fender Play platform, your child can start playing a song in minutes and track their performance. The curriculum was created by experts and the leading guitar brand. The curriculum is based on your musical preference, so if you like folk, you learn folk. If you like rock, you learn to play rock. Fender Play helps you learn to play the songs you love by breaking it down into the basics first. You can access the Fender Play dashboard via your computer or their app. 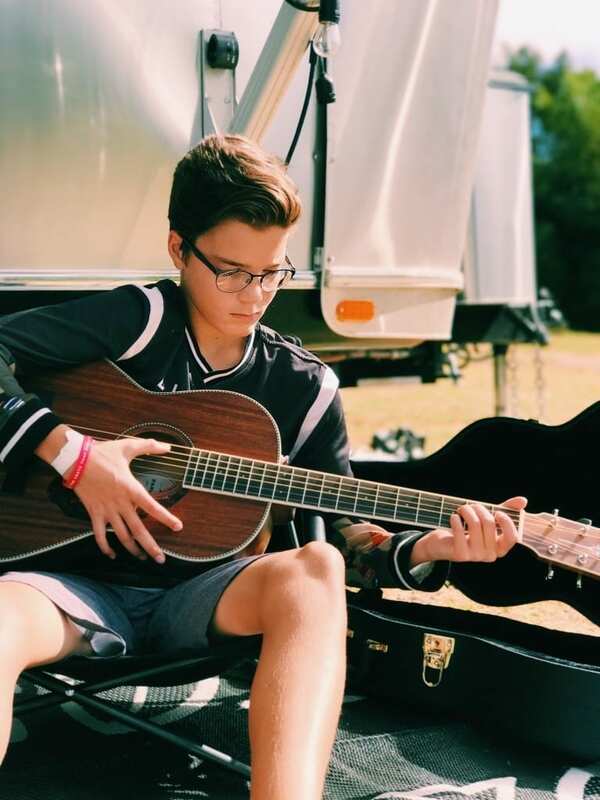 You can read about my oldest son’s progress with Fender Play here. I was super impressed, to say the least. Thanks to Fender, I get to offer one (1) Mom Fabulous reader a Squier® Strat® Pack and a six (6) month Fender Play Subscription! The Squier® Strat® Pack is the perfect setup for beginners. It comes with everything you need to begin playing right out of the box. The pack comes with a Stratocaster (24″) guitar, Squier Frontman® 10G amplifier, strap, cable, and picks. Between this pack and the Fender Play subscription, a beginner guitar player has everything they need and will be well on their way to playing songs on the guitar they know and love. This would make one fantastic Holiday gift for someone! To enter, read the official rules and follow the instructions on the Rafflecopter form below. Good luck! Awesome article, as per usual! G, just told me this week that he wanted to learn to plan the guitar! This would make a perfect gift for him! I would gift this to my son. He would be over the moon, especially with lessons he could do at home. I would give this to my husband. He has always wanted to play the guitar. My 14 year old is trying to learn to play. We’ve checked out Fender play when you first posted about it. Hoping to win this guitar for Christmas! Looks like you guys are having an amazing adventure, Julie! I’d love to give this to my son Nathan! My son would get it. This is awesome. As Cheyanne has asked for a guitar for christmas. My daughter actually asked for an electric guitar for Christmas but there simply isn’t money to buy her something like that this year. So it would be pretty amazing if I won. I would love this for my oldest. He is wanting to learn and this would be perfect! I would gift it to my nephew. Awesome giveaway. The whole family can channel their inner rock stars!! I would keep it. I have always to learn how to play a guitar! I’m guilty, I’d keep it for myself! I won’t lie. I would actually keep it for myself since I love guitars. I would give this to my son. He would love it under the tree! I would love to have this,I have always wanted to learn to play and have been a big music fan my whole life! I would keep it. Have always wanted to learn how to play! I’d give this to my oldest son!! I have always wanted to learn to play the guitar so would probably keep this for myself. I would give this to my cousin who will be very happy to learn. This is a great package for a young beginner! Would keep this in the family so the young ones can learn to play as well. I’d keep it for my husband and I ? I’d give it to my boyfriend! I think I would give this to my nephew, I think he would love this! Thank you!! I would honestly either give this to my dad or keep it for myself. My dad already has at least one guitar so I am tempted to keep it to learn how to play! I’d keep it! I’ve always wanted to learn how to play! I use to play guitar for a very long time.I got in debt 15 years ago when layed off from a job.so first thing I sold were my guitars to pay bills.I miss playing just never has enough extra me money to play again or purchase .At that time I owned a fender gemini lll acoustic and a fender strat.always felt a piece of me was missing with how I enjoyed playing.music warms the soul. I’d give it to my hubby! 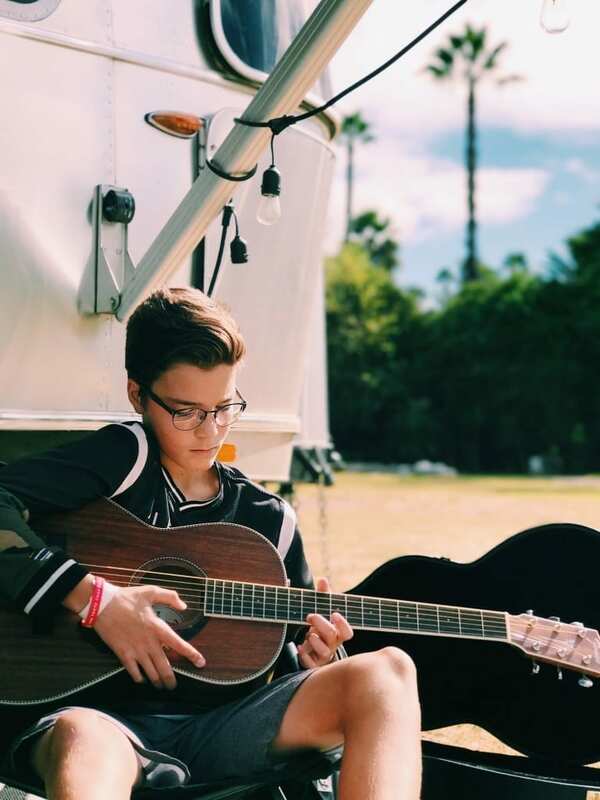 He wanted to learn to play guitar when he was younger but never did. Thanks and God Bless! this would be for my son, he would love it. My oldest son would love this, so I’d gift it to him. I’d of course get to play it while he’s in school…lol. Thanks! I am pretty sure I would give this to my son. I would give it to my son Jacob. I would give this to my kids. They love playing instruments. I would give it to my son who would absolutely love it! I would give it to my er. I’d give it to my dad!